An alkaloid isolated from the plant is commonly used in conventional medicine - the plant being gathered from the wild for this purpose. The leaves are also commonly used in herbal medicine. 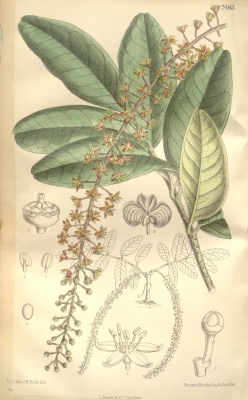 Jaborandi has long been used in traditional medicine in S. America, where native people have employed the plant as a natural remedy for epilepsy, convulsions, gonorrhoea, fever, influenza, pneumonia, gastrointestinal inflammations, kidney disease, psoriasis, neurosis, and as an agent to promote sweating. Extensive modern research has borne out the efficacy of many of these treatments. Another alkaloid in the leaf, jaborine, has been shown to counteract or decrease the effects of pilocarpine, which means that one cannot simply relate the effective dosage of a leaf extract based solely upon the pilocarpine content of the extract.